A former Sausalito wine keeper who pleaded guilty to setting a warehouse fire that destroyed 6 million bottles of wine valued at more than $200 million asked a judge on Tuesday to withdraw his plea and go to trial instead. Mark Anderson, 62, told a federal judge that his former attorney, Mark Reichel, was unprepared to try his case and duped him into pleading guilty by promising a short sentence. He has yet to be sentenced. Reichel’s response was included in a filing by U.S. Attorney Benjamin Wagner in June opposing Anderson’s motion to withdraw his guilty plea. It prompted an angry and dramatic response from Anderson. Anderson pleaded guilty in November 2009 to 19 criminal counts, including arson, mail fraud and tax evasion, in the 2005 fire on Vallejo’s Mare Island. 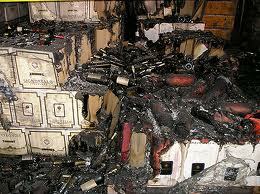 It destroyed bottles belonging to 92 wineries and 42 private collectors. Some of the wines were considered rare.